While monitoring your VoIP set-up, two high priority areas to be tracked are QoS(Quality of Service) and Call drops. In our upcoming release, we have added two new graphs which help in quicker troubleshooting of poor call quality and call drops. This new graph is a line chart plotted every hour, showing the successful calls categorized based on quality distribution [Good, Tolerable and Poor]. One can click on any of the data points and drill-down to the call list showing the calls that contributed to the bad quality and further debug by accessing individual Call Details pages. Based on the history data range chosen in the calendar, one gains insight on the call quality deterioration on an hourly/daily/weekly/monthly basis. As always, you can easily compare various weeks’ peaks and lows to analyze traffic patterns and foretell network capacity needed. NOTE: In VQManager, the quality of a call is determined based on the MOS score of a call. The MOS score takes into account all other quality metrics such as delay, jitter, loss, codec etc., in a call. The MOS thresholds are user configurable. Here’s the default VQManager scale of call quality using MOS values. ‘Call By Status’ is a pie chart having percentage of Successful calls, Unanswered calls, Error calls & Unmonitored calls. With this, one can easily identify which type of calls are largely prevalent in the VoIP network. In call centers, one would not want a high number of unanswered calls. In the case of an enterprise or VoIP service provider, it is Error calls that will be a source of headache. 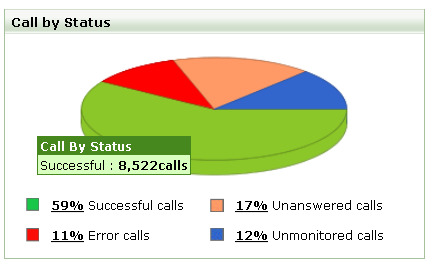 The mouse-over on the pie will show you the number of calls contributing to the particular call status. By clicking on the link one gets all the respective calls in a list view, from where one can either drill down to the Call Details page or search for the Initiator and Participant to drill down and troubleshoot. Wait for a few more weeks and you can use the above graphs live in your environment. It gives enough information. Nice topic. Thanks for posting this one.